French Talmudist; died May, 1806, at an advanced age in his native city, Metz. His father was a member of the rabbinical college in that city. Phoebus also became a rabbi, and conducted a Talmudic academy there. At first he was assistant rabbi under Aryeh Löb b. Asher Günzburg. 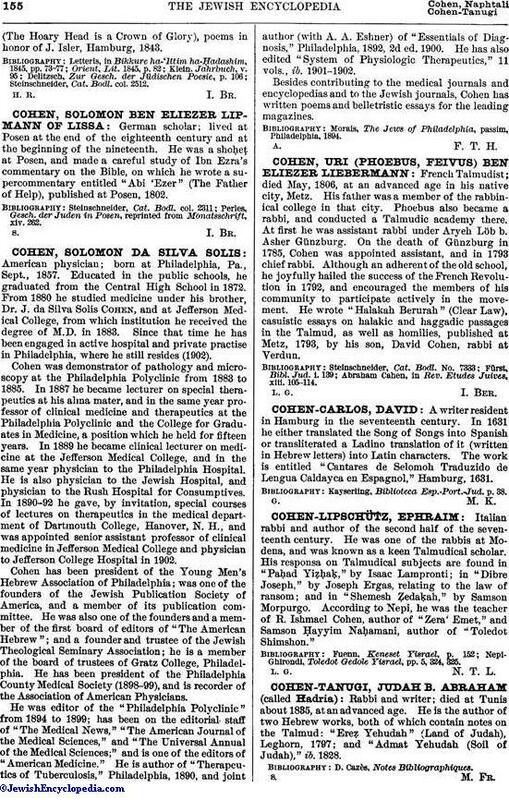 On the death of Günzburg in 1785, Cohen was appointed assistant, and in 1793 chief rabbi. Although an adherent of the old school, he joyfully hailed the success of the French Revolution in 1792, and encouraged the members of his community to participate actively in the movement. He wrote "Halakah Berurah" (Clear Law), casuistic essays on halakic and haggadic passages in the Talmud, as well as homilies, published at Metz, 1793, by his son, David Cohen, rabbi at Verdun. Abraham Cahen, in Rev. Etudes Juives. xiii. 105-114.